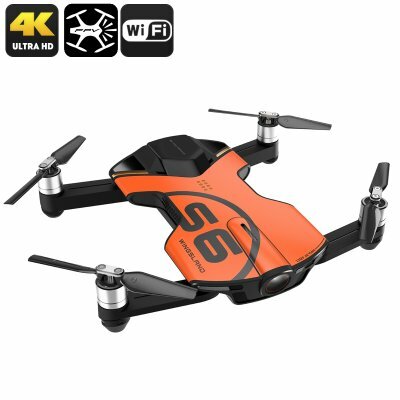 Successfully Added Wingsland S6 Premium Drone - 4K Camera, Foldable Design, Wi-Fi, FPV, Home Return Key, 4 Flight Modes (Orange) to your Shopping Cart. The Wingsland S6 is the crown jewel of the drone industry, being among the thinnest and most compact 4K drones in the world that comes packed with the latest drone technology. Featuring an extremely compact design and weighing just 230 grams, this drone holds about the same size as an iPhone 6. Its foldable wings make this tiny drone even more portable, as it allows you to simply and safely carry it around in your pocket without the need to worry about damaging its blades. Equipped with a mesmerizing 4K camera, tons of other top end hardware, and the ability to upgrade the device with numerous accessories, the Wingsland S6 truly is a drone that tops the global industry. Holding the latest software features this quad-copter comes along with numerous fly modes that are sure the grab your attention. It’s ‘’Follow Me’’ mode lets the drone allow the operating mobile device automatically, allowing you to record yourself or others riding their bike, skateboard, or play sports without even needing to hold a controlling. Featuring four different flight modes you can be assured that this high-end drone suits the flying style of beginning drone pilots and truly advanced enthusiasts alike. With its 1400mAh removable battery, you are allowed to fly for 9 minutes straight before running out of juice, providing you with enough time to scout the area and snap some stunning 4K video and images from above. Thanks to its "Home Return’’ feature you can be assured that your drone can automatically find back its way to the controller when the battery is running low, ensuring that it will never run out of juice while in mid-air. With the drone’s auto take-off and landing capabilities the Wingsland S6 Quad-Copter allows you to smoothly take off and land, significantly decreasing any chance of damage to your drone. Its foldable design additionally makes this professional drone easy to store without needing to worry about snapping off any parts. With a reach up to 100 meters, the Wingsland S6 Quad-Copter is fully capable of exploring your wide surroundings. Supporting both Wi-Fi and FPV this drone allows you to sync it with your FPV glasses, giving you a first-hand drone experience. With a display resolution of 720p this Quad-Copter lets you experience what it’s like to be a real drone pilot while conquering the skies through your FPV paired goggles. Reaching speeds up to 8m/s you’ll be able to fly to any nearby destination in no time – allowing you to snap stunning 4K footage and images at sight. This Wingsland S6 Drone comes with a 12 months warranty, brought to you by the leader in electronic devices as well as wholesale electronic gadgets..